The annual 20th-century music festival Musikfest Berlin (Sept.2-22) this year undertook the ambitious agenda of exploring the evolution of the orchestra from Brahms and Strauss to Lachenmann and Widmann. Intriguing programs have emerged at the Philharmonie, with a roster of guest ensembles ranging from the Munich Philharmonic to the Cleveland Orchestra alongside local institutions. But the event’s Germanic focus eschews a plurality in modern music that is impossible to ignore. References to the German capital’s central role in history abound in program notes—“Music belongs without a doubt to a particular Berlin tradition,” writes Culture Minister Monika Grütters in an opening greeting, and we are told that Felix Mendelssohn was still a “genuine Berliner” when he wrote his Trumpet Overture, op.101. But the attempt to tie contemporary composers inextricably to a monumental classical-romantic tradition ignores irreversible cultural-historical shifts of the 20th century. Although the programming explores the toppling and reconstruction of orchestral form, we are left with a sense that everything somehow circles back to Bach and Brahms. A concert of the Radio Symphony Orchestra Berlin under Vladmir Jurowski segued nicely from a focused, authentic performance of Mendelssohn’s Trumpet Overture into Magnus Lindberg’s Chorale, an eerie setting of J.S. Bach’s of Es ist genug, with monumental brass that fight in vain to break through the sea of strings. Schönberg’s masterfully orchestrated but pompous setting of Bach’s Prelude and Fugue for Organ in E-major provided tonal respite from the Chorale’s dissonant uncertainty and spiritual ambiguity before Schnittke’s Third Symphony deconstructed western tradition even further with distorted, at time cheeky references to Wagner, Strauss, Mozart and more. When a cembalo attempts to have its word with a a Bach keyboard prelude in the inner Allegro, only to lose out to a sardonic waltz bass line on the harps, and then an organ cluster that crashes from above, the message is clear. Schnittke moves at will in and out of modernism and post-modernism, searing dissonance and tonal clarity, with minimalist textures that cede to a post-Romantic lament in the final Adagio before the music ends in an irresolute nether. Jurowski presided over the 111-strong ensemble with sinuous gestures and unforced precision. A program of Reger, Strauss and Lachenmann with the Bamberger Symphony followed similar dramaturgical contours, emphasizing the line from Reger’s war-traumatized, at time proto-serial dissonances, to Strauss’ forward-looking harmonies, to Lachenmann’s reinvention of timbre and structure. “As radical as the music after 1945 may seem, a reference to the classical-modern tradition usually established itself,” we are told. Lachenmann’s Ausklang, which ended the program, adheres to the binary opposition of piano and orchestra that defines a concerto, building itself around the soloist’s attempt to break through with a single tone. There is even a second piano onstage, where the player is armed with a hammer to respond to the protagonist’s insistent gestures. After the orchestra is reduced to ghostly, hollow sounds—an example of Lachenmann’s ability to turn timbre literally inside-out—a string melody breaks through, and sounds ricochet throughout all sections of the orchestra in a kind of da capo reference to the work’s opening. In the end, the soloist wins with two major, triadic chords. The pianist Pierre-Laurent Aimard, a seasoned performer of this work, gave a tour-de-force in fierce virtuosity and playful dramaticism, while the orchestra realized the range of extended techniques with admirable control under Jonathan Nott. The program opened with a polished account of Reger’s Fantasy and Fugue for Organ in d-minor, as performed by Christian Schmitt. The shades Bach and Brahms, thwarted by shattering dissonances, provided an interesting bridge into the dreamy but devastated world of Strauss’ Four Last Songs in an enchanting if underpowered performance by soprano Genia Kühmeier, who jumped in for Christine Schäfer. The Munich Philharmonic, despite the recent loss of its Music Director Lorin Maazel, made a fine ambassador for its long Strauss tradition with a program of two of his best-known tone poems, Don Juan and Ein Heldenleben, and the Horn Concerto No.2. If the Staatskapelle Dresden owns this music with a round glow and sensuous line, the Munich players bring a staggering level of detail and exactitude to the inner voices. Semyon Bychkov presided with a clear, sophisticated baton technique that was balanced by calm and restraint. Soloist Jörg Brückner brought masterful articulation and breath control to the Horn Concerto, particularly in the lively final Rondo. What a shame that the hall was half-empty. 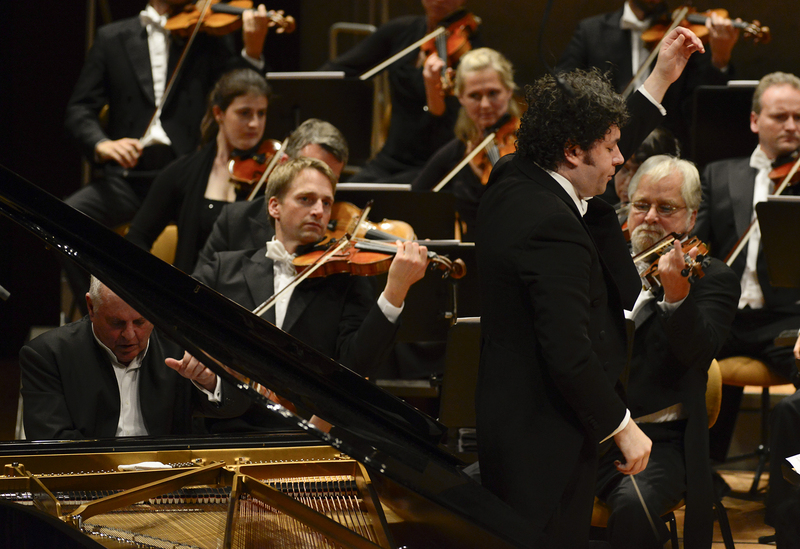 That was not the case for the opening concert of Brahms’ First and Second Piano Concertos with Daniel Barenboim as soloist alongside the Staatskapelle Berlin, which performed not under his direction but that of guest conductor Gustavo Dudamel. 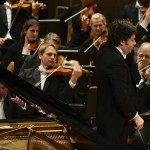 The audience went wild despite the musicians’ awkward coordination and Barenboim’s under-rehearsed performance. Dudamel beat his baton mechanically and attempted to keep the orchestra together with the the pianist’s willful, elastic phrasing, which included its fair share of smudges. Both soloist and orchestra achieved a melting pianissimo in the inner Andante of the Second Concerto, and Barenboim’s tireless trills and sensitive dynamic shading nearly compensated for the lack of precision elsewhere, but Dudamel’s tense presence belied the imbalance of the situation. The evening, meanwhile, only underscored the contradiction of centering a 20th-century music festival around the temple of German music. Even if one ascribes to Schönberg’s theory that Brahms was a “great progressive,” one must still account for Dvořák, Lalo, Sibelius, Stravinsky. . .particularly in a city that claims to have rebuilt itself as a cosmopolitan capital for the arts. This entry was posted on Thursday, September 11th, 2014 at 1:40 pm	and is filed under Berlin Times. You can follow any responses to this entry through the RSS 2.0 feed. Both comments and pings are currently closed.